With it's French-sounding name, many people automatically assume Descente is another chic brand of ski-clothing from France. But it's not - it's Japanese. And as is the case with the other companies in Japan who produce ski clothing (e.g. Phenix, Goldwin), Descente's apparel is technically superb, with a real history of innovation in designing and manufacturing clothing for the top level of ski-racing as well as other winter-sports such as speed-skating and sledding. 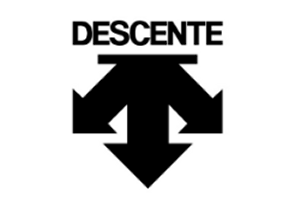 Descente's iconic Spirit company logo, dating way back to it's creation well over half a century ago, depicts 3 basic skiing techniques - traverse, schuss and side-slip. Descente was first formed back in 1935, with Takeo Ishimoto starting the company in Osaka, Japan, after inventing a revolutionary pair of stretch ski pants. By the 50's Descente were involving professional athletes in the design and creation of their product, calling it "Summit Strategy". This meant that the likes of Kazuyoshi Nishimura, Japan's first pro skier, became advisors to Descente, giving them an edge over their rivals and a credibility within the industry. Nishimura's involvement in the subsequent years helped take Descente to the top of Japan's skiwear market, and one of the primary reasons was that their jackets were some of some of the first to combine functionality and style. Having achieved a fine reputation in it's homeland in the 1950s and 1960s, Descente set about expanding it's brand-appeal globally, and it had effectively achieved this by the 1970's as they created new styles of ski racing gear, including the "Kris-Cut", to help improve aerodynamics and gain vital race time. Descente suddenly had an international reputation as a leader in high-performance sportswear, never more evident than when one of the big European ski-teams, the Swiss, snubbed the traditional European brands and adopted Descente as their official supplier. Descente continued to lead the way throughout the 1970's, and not just technologically. They styling of their ski-racing outfits were catching the eye, quite literally, of the big ski national teams, and in 1974 they became the first company to superimpose graphics onto it's race suits, having commissioned Kazumasa Nagai (designer of the 1972 Sapporo Winter Olympic's logo) to design the graphics for them. The new products were dubbed "Kiryu", translating as "dazzling flow". Descente now had a reputation for creating fashionable products, as well as one's that made top skiers faster ! National teams continued to switch over to Descente as the Japanese continued to introduce new and improved ski-suits onto the marketplace, with designs like the fantastically named "Magic Suit" knocking down race times of the top skiers by reducing air-resistance using new textiles and cuts. The Austrians even swapped over mid-season in 1979 having seen the success of their rival teams, and then their own results improved dramatically ! Whilst famous skiers of the day Ken Read and Peter Mueller both openly spoke of the difference the suits made. The 1980s also saw Descente expand into other areas of the sporting world by using the aerodynamic techniques and materials in other types of suits. Probably the most famous was the one it produced for speed skating - worn by American Eric Heiden at the 1980 Lake Placed Winter Olympics, it became known as the Golden Suit after he raced to 5 gold medals whilst wearing one. Descente's gear was now being worn in nearly all the main winter arenas - mountaineering expeditions, ski jumpers, cross country skiers, bobsleigh teams, even the crazy folk who did luge and skeleton bob, they were all wearing Descente gear. Descente even got involved in warmer weathered sports too, developing a single-piece cycling outfit that became the standard design of the top cyclists. And they looked good too - iconic designs such as the famous green/red suits worn by the 7-Eleven team in the mid 80s. All of these high-performance products, used successfully by so many of the world's top athletes, all combined to give Descente a fantastic reputation and has led to an increase in demand for its products in the general marketplace. Still head-quartered in Osaka, Japan, it also has a growing presence in North America, where it has opened a number of offices. As with the other Japanese winter-sports brands, Descente has a strong reputation for the technical performance of it's clothing, but it has the added bonus of looking fantastic too. You can date Descente's dedication to both areas right back to the 1950's when the company shot to the fore-front of the ski-clothing industry in it's native Japan by designing one of the first range of jackets to combine both style and functionality. And Descente became the ski-racers choice of clothing by the 1970's, not just because their fabrics and aerodynamic design were knocking off vital seconds from the racers times, but because Descente were leading the way in how racers looked, becoming the first brand to include graphics in racers' outfits, and creating iconic competitive skiwear such as the Spanish team's rainbow-coloured, modern-art-esque ski-suits from 1976, which completely changed the standards and expectations of ski-race attire from that period onwards. This vibrant history of design is still reflected today in it's range of outfits for recreational skiers, with a real attention to detail in the way Descente's jackets and pants look. In a word... quality. But what else would you expect from a company that has been at the fore-front of technological and design advances, not just in ski-racing but other winter sports such as speed-skating, ski-jumping and sledding, as well as a successful dabble into creating clothing for non-winter sports such as cycling. From the company's creation back in the 1950's, Descente's philosophy has been to strive for excellence in every step of a product's creation, from it's inception and design, right through to the manufacturing of the final product. The Japanese company has specific teams to think up innovations, team's to work on the design of these new ideas, and team's of craftsmen to bring them to reality. And from it's early days the company has worked closely with professionals from the winter-sports arena to develop and test their products. Such passion and commitment to designing and creating quality clothing, coupled with the fact that it's been used consistently at the highest level of the sport for decades, all add up to a brand that is the real deal when it comes to top-notch skiwear. Unfortunately, top performance and style doesn't come cheap ! The majority of the Descente jackets that you'll come across for sale in the UK will be around the 400 pounds mark, for both men and women. As ever, you can get them much cheaper in the end of season sales, where you'll often find them right down to 200 pounds, not bad for something that's still technically as good as ever, but that it's style is about 6 month's old !